GeoVax Labs, Inc. (“GeoVax” or “the Company”) is a clinical-stage biotechnology company developing preventative and therapeutic human vaccines against infectious diseases and cancer. The Company’s patented Modified Vaccinia Ankara Virus-Like Particle (MVA-VLP) technology is the foundation for producing non-infectious virus-like particles (VLPs) from the cells of the individual receiving the vaccine. Producing VLPs in a vaccinated individual mimics a natural infection, stimulating both the humoral and cellular arms of the immune system to recognize, prevent, and control the target infection should it appear, while maintaining the safety characteristics of a replication-defective vector. GeoVax is focused on developing vaccines against hemorrhagic fever (HF) viruses (Ebola, Sudan, Marburg, and Lassa), Zika virus (ZIKV), malaria, and human immunodeficiency virus (HIV). The Company also has programs to develop a vaccine to treat chronic Hepatitis B virus (HBV) infection and to apply its MVA-VLP technology to cancer immunotherapy (immuno-oncology). Furthermore, GeoVax recently announced that it is collaborating with Emory University to develop a therapeutic vaccine for human papillomavirus (HPV) infection, with a specific focus on head and neck cancer (HNC). GeoVax believes its expertise is complementary to a range of other human diseases for which there is an unmet medical need, and thus, has plans to expand its pipeline. On August 14, GeoVax announced the appointment of David Dodd as Chairman, President, and CEO, in conjunction with the retirement of Robert McNally, Ph.D., President and CEO. Mr. Dodd will assume this new, expanded role upon Dr. McNally’s retirement, effective September 1. Mr. Dodd brings significant experience leading and developing multiple companies in the life science industry. Dr. McNally will continue to serve on the GeoVax Board of Directors. 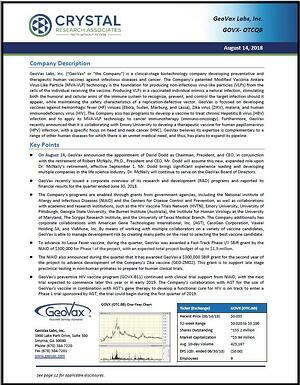 GeoVax recently issued a corporate overview of its research and development (R&D) programs and reported its financial results for the quarter ended June 30, 2018. The Company’s programs are enabled through grants from government agencies, including the National Institute of Allergy and Infectious Diseases (NIAID) and the Centers for Disease Control and Prevention, as well as collaborations with academic and research institutions, such as the HIV Vaccine Trials Network (HVTN), Emory University, University of Pittsburgh, Georgia State University, the Burnet Institute (Australia), the Institute for Human Virology at the University of Maryland, The Scripps Research Institute, and the University of Texas Medical Branch. The Company additionally has corporate collaborations with American Gene Technologies International, Inc. (AGT), CaroGen Corporation, Vaxeal Holding SA, and ViaMune, Inc. By means of working with multiple collaborators on a variety of vaccine candidates, GeoVax is able to manage development risk by creating many paths on the road to selecting the best vaccine candidate. To advance its Lassa Fever vaccine, during the quarter, GeoVax was awarded a Fast-Track Phase I/II SBIR grant by the NIAID of $300,000 for Phase I of the project, with an expected total project budget of up to $1.9 million. The NIAID also announced during the quarter that it has awarded GeoVax a $300,000 SBIR grant for the second year of the project to advance development of the Company’s Zika vaccine (GEO-ZM02). This grant is to support late stage preclinical testing in non-human primates to prepare for human clinical trials. GeoVax’s preventive HIV vaccine program (GOVX-B11) continued with clinical trial support from NIAID, with the next trial expected to commence later this year or in early 2019. The Company’s collaboration with AGT for the use of GeoVax’s vaccine in combination with AGT’s gene therapy to develop a functional cure for HIV is on track to enter a Phase 1 trial sponsored by AGT; the trial could begin during the first quarter of 2019. 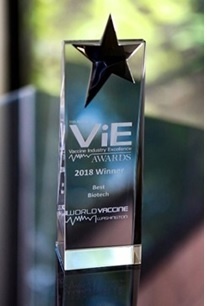 During the 2018 World Vaccine Congress, GeoVax had its work recognized by peers through winning the “Best Biotech” Vaccine Industry Excellence (VIE) Award. GeoVax was also a finalist for the “Best Prophylactic Vaccine” VIE Award for its Zika vaccine. Moreover, during the BIO International Convention, GeoVax was a finalist for the Pipelines of Promise award.